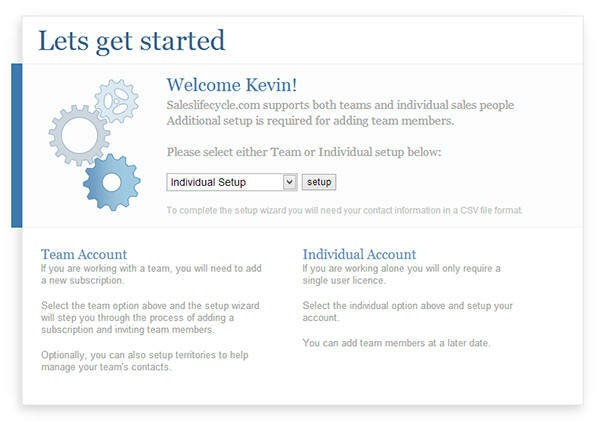 To help you get started and productive as soon as possible we encourage you to run the setup wizard after signing up. The wizard will step you through the process of setting up your account for either a single user or a team account. All steps can be skipped and you can stop the wizard and return to it whenever you want. The wizard is a simplified interface for the Admin section of your account, all of the actions you can perform in the wizard you can also do in the admin section. If you want to just try out saleslifecycle.com and see if it is a good match for your requirements don't forget that you can jump into our live demo account. What are the differences between team or individual accounts? The only difference is the addition of other team members in your account. Having additional team members lets you share contact information, collaborate together on deals and delegate tasks. You can add additional team members at any time, so don't feel like you need to know up front if you want to setup for teams or not. Each step of the wizard can be skipped and completed at a later time. To complete the wizard just go though each step and answer the questions as best as you can.